Is A/D-converter research in Europe about to die? Number of scientific publications reporting measured A/D-converter implementations –by first-author affiliation location. Is A/D-converter research in Europe about to die … or has it just gone into hiding? 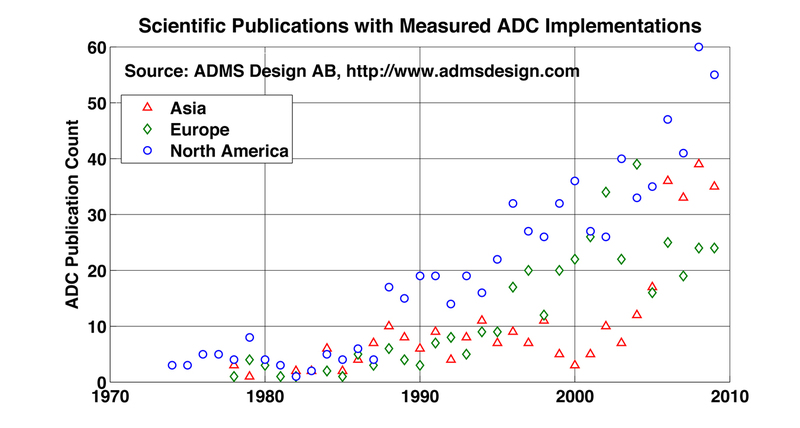 Well, looking at the publication statistics for measured ADC implementations justifies the question. In the overall publication count, there aren’t any signs of concern – Europe still has an accumulated 27% after North America’s 50% and before Asia’s 23% of all publications, as shown in a previous post. But Europe has lost a significant amount of wind in the last five years, which is obvious from the year-by-year stats shown in the plot. It seems that North America is maintaining its leadership in publications, but that Asia picked up some serious speed by 2006, while research publications from affiliations in Europe simultaneously dropped dramatically. North America and Asia both shows a steady increase, and note also that Asia has a steeper slope than North America. Europe is the only region that appears to level out at a lower publication rate. Why? Is Europe lacking the financial or intellectual muscle required to compete with North America and Asia? Is it a European view that the A/D-converter is a “commodity” that is best supplied from elsewhere and nothing of interest remains to be researched? Did European research “go into hiding” within companies and institutions that put a lid on their research results for commercial reasons? In that case, is the lack of publications merely a sign of good “industrial health”? Or has Europe simply lost its vision for ADC research? What do you think? Share your thoughts and insights by leaving a comment or by taking the poll (multiple choices allowed). The underlying data set is the same as in , but data for 2010 have been excluded since the results for 2010 are not settled yet. The main sources surveyed are listed here. Since I know a lot of people in Sweden and Europe that are active in ADC research, these results were surprising to me. My impression is (still) that there’s a lot going on in Europe, and therefore I would have expected all regions of the world to be increasing their publication rate. Obviously there are a lot of things to be said about how well a simple measure like “paper count” detects the research activity of a region. Nevertheless, there is a clearly different trend for Europe, and it does raise some interesting questions about what’s going on.